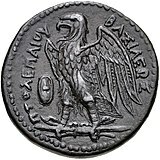 Eagle of Zeus, on a Ptolemaic Drachma. The "Aetos Dios" (Ancient Greek: άετός Διός) is translated from Greek into "Eagle of Zeus". There are two schools of thought regarding the origin of this eagle, coming from different Greek legends. According to Antoninus Liberalis, Periphas was a legendary king of Attica who was a just king, and a dutiful priest of Apollo. Zeus however became indignant because Periphas was revered and honoured as if he were Zeus himself, so Zeus wanted to destroy Periphas and his entire household. But Apollo interceded, and instead Zeus transformed Periphas into an eagle, making him king of all birds and guard of his sacred sceptre. ^ Antoninus Liberalis, Metamorphoses 6, pp. 118–121; Cook 1925, pp. 1121 ff..
Cook, Arthur Bernard 1925, Zeus: A Study in Ancient Religion, Volume 2, Part 2, Cambridge University Press, 2010. ISBN 9781108021319. This page was last edited on 26 February 2019, at 16:50 (UTC).